This is the third year I've had a Christmas card designed by the amazing Ann at Zoolatry. 2014 was Truffles' first and only card; Tiny Truffles Christmas Carol was born from my love of the classic story. Last year I wanted Mudpie's first card to double as a Truffles tribute, and Ann's creation of Mudpie reading Tiny Truffles Christmas Carol by the fire completely took my breath away. 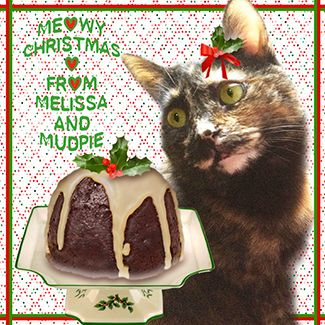 This year I found my inspiration in a Christmas card I saw on Etsy featuring a kitty popping out of a plum pudding. A fan of all things British I challenged Ann to recreate it. We'd like to thank everyone for all of the wonderful snail mail and e-cards that we've been receiving. Each and every one of them means so much to us. I love your card! I can't wait til I have enough to have my Christmas ecard page on my blog! Such a beautiful card!! I've got to get bust and do our card!! When we received ours we fell in love with it instantly! You are just too cute, Mudpie. And I just love that festive little bow, too. Purrs, and a merry Christmas season to you, Mudpie and Melissa! Purr-ecious! Meowy Christmas, Melissa and Mudpie! Miss Mudpie looks so cute with the holly on her head, I love your card. LouLou, the french kitty had a recipe for plum pudding on her blog yesterday. I would love to try it, but I am too lazy. Wow - we love your card Mudpie - Anne always does such wonderful cards and blog headers. That is a sweet card. Cake looks good! Meowy Christmas, friends! We will be emailing our card very soon. Your card looks just bootyful. But we'd expect no less. Gawjus Mudpie and talented Ann, a combo dat can't be beat. How cute is that. Thank you for sharing it! Awww, we LOVE your card! We got ours yesterday in the mail and it's now snuggling with so many others on the mantle. Card count for us cats so far: 24. Card count for our Mom and Dad so far: 1. MOL! Beautiful!! I love the holly around the ear! Mudpie--Amarula asks that you pls save a yummy piece of that cake for her! I love the holly bow on her ear. So adorable! That is wonderful! And it makes me a little hungry. I'm off to find me some cake! Thanks for the suggestion! We got your card yesterday. Thanks. It's a cute card just like MP. These are all beautiful holiday cards! Great job. Happy Holidays! Thank you for the wonderful Christmas Card, Happy Holidays!